Me (after perusing the racks of flavorings): Do you have lavender flavoring? C&B guy: Flavoring? No. We have color. I’ve never heard of lavender flavor before. Me: Okay, yeah, I looked for it, just making sure. Do you have any idea where I could get lavender flavor? C&B guy: I’ve never heard of that flavor before. Me: Well, I’m experimenting with new buttercream flavors. C&B guy: Well then you need lavender color! Me: No, no, I don’t actually want it to be lavender color, just flavor. Never mind. C&B guy: I’ve never heard of that flavor. Me: Never mind, I’ll just have to make it with tea or something. Turns out that there’s no such thing as just lavender tea at Whole Foods. I get three salespeople on the case, but no dice. What I really need are loose dried lavender flowers to make an infusion, but there’s snow everywhere, freezing rain falling, and I don’t know where to get loose herbs in the city. So I’ll have to save the lavender experiment for another day. 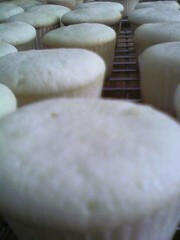 I’ve made four or five dozen miniature cupcakes, in three flavors: vanilla, lemon, and almond. I estimated wrong and ran out of miniature cupcake liners, so the vanilla ones are actually heart-shaped tea cakes (disappointing, but what are you going to do?). And while the cupcakes baked, I’ve been soaking apricots, cardamom, and ginger in hot water (separately) to make infusions for interesting new buttercreams. I’ve also got blackberries (no, I’m not sticking to in season this time around), coconut flavoring, oranges, and any number of other fun spices and flavor ideas, like cinnamon, maple, mocha, honey, lemongrass (can’t do this one today, sadly). So my question is… which unusual flavor combinations sound appealing to you? Which sound dreadful? Buttercream Flavors: ginger, apricot, blackberry, raspberry, strawberry, blueberry, pomegranate, coconut, maple, cinnamon, mocha, honey, lemongrass, lavender, rose, cardamom, cherry, yoghurt, pepper, jalapeno, coffee (not mocha), hazelnut, lychee, tropical fruits like mango, papaya, guava, cherimoya, lime, peanut, caramel, orange, mint, lime, chocolate, vanilla, cumin… anything else? p.s. These are all for a party a friend of mine is having tomorrow. omg. between you and ina, i’m dying over here. just make them all and whatever doesn’t get eaten, just send them my way. for real. And as soon as you make the infusion for your icing, and your cupcakes are iced, I’ll be right over. cumin buttercream, I have to admit, sounds pretty offputting to me. have you made it before? Did you ever check out the flour recommendation I made a few weeks back? Would they wholesale to you? I would think ginger rose, on a lemon or vanilla cupcake sounds divine. All the extracts you could ever possibly imagine!! All I made this weekend was lemon cupcakes with fresh strawberry centers and a caramel cake. You’re putting me to shame. More details on infusing buttercream frosting, please. Anything else? Orange Flower Water is my favorite. Try any large ethnic store that has Middle Eastern or Asian foods. Dean and DeLuca have/had Lavender and other essences and flavoring but they like them more than I ever could. Cake decorating supply stores usually have an odd and large supply of flavorings, very strong/concentrated sold as candy flavoring, small bottles, only takes a few drops and don’t leave the droppers in the bottle. I use Orange Flower water and Rose water in cake and cookie recipes. Use as you would vanilla. Works in frostings, meringues and marshmallows, too. If it is easier, The Baker’s Catalog by King Arthur Flour has flavorings and waters, email or call them if it isn’t in the catalog. Butter can be infused with flowers or tea. Heat gently just to warm and melt and add whatever. Strain after about 5 minutes. Jasmine tea is excellent for this. Very old French technique. Middle Eastern– Orange flower and almond, Rose and pistachio, orange and walnut…orange, cardamom, walnut. Green tea and chocolate. Strawberry and rose. Chocolate and ginger. Apricot, pistachio and cardamom. Ahhh, don’t forget to keep putting up pictures. But now I’ll need to make cookies tomorrow, Oatmeal with pistachios, apricots, orange flower water and a pinch of cardamom. A few years ago I was going to buy Rose water at Wild Oats and the clerk became distressed when she found out I was going to use it in food. It was a French brand, but she didn’t think it was a good idea to use flower waters that way.